The Frigg seemed like any ordinary girl, but she was different. Most girls her age were frail, quiet, and obedient. The Frigg was tough, loud, and very unruly. Her parents found her to be a nuisance, and wished she would learn how to be a lady, and patiently wait for the day her suitor would arrive. Um, yeah, any chance of this bonus story ever being finished? Realistically, not much. These commentaries aside, both Phil and I were pretty firmly ready to leave GA behind when it ended. But I’ll see if I can work more of the notes for it in at some point. 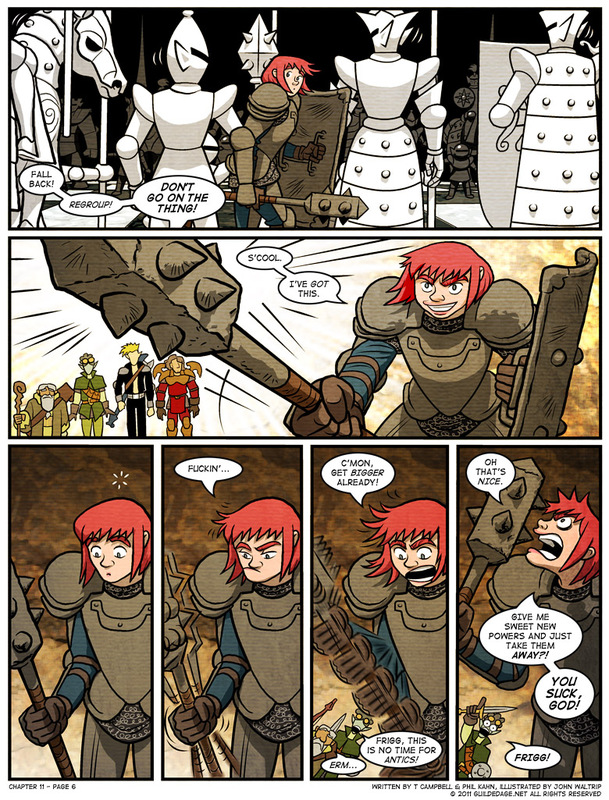 On this page we get a great close look at Frigg’s armor. I find myself examining the care with which you drew the plate and the chain-mail and the placement of the each piece of protective gear, and yet, her big melon of a noggin is exposed and ready for the Gallagher treatment at any moment. Can’t be helped, I guess. Would’ve been interesting to see Frigg’s parents. She and Best never got any backstory beyond chapter one. Penultimate panel: Uh huh huh, that’s what she said. I mean, she did. Undeniably. It’s right there.